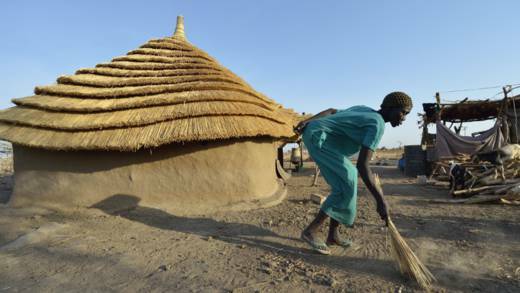 Ayek sweeps around her home built by Caritas in Abyei, a contested region along the border between Sudan and South Sudan. Severe drought and conflict in South Sudan have left millions of vulnerable people in need of humanitarian aid. 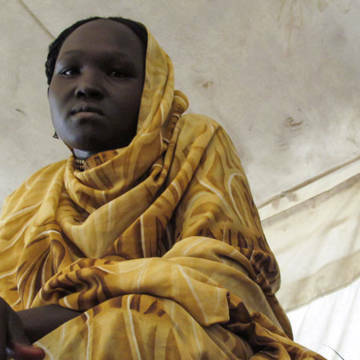 South Sudan is entering its fourth year of conflict and millions of people are in need of urgent humanitarian aid. In February 2017 the United Nations declared a famine in parts of the country. 9 July 2011 marked a momentous occasion – the birth of South Sudan as an independent nation. But the world’s newest country is facing a major humanitarian crisis, caused by severe drought and an ongoing conflict. In December 2013 fighting broke out between South Sudanese government forces and rival political factions and the conflict has forced millions of people from their homes. South Sudan was already one of the world's poorest countries. Many people in rural areas cannot access drinking water, and a lack of doctors and health clinics has led to some of the worst maternal mortality rates in the world. We are supporting communities to earn a living through better farming methods. We are providing food, water and essential household goods to people who have returned or been displaced by fighting. We are promoting justice and peace, tackling the spread of HIV and AIDS and providing clean water and education. We are providing emergency assistance to people affected by drought who are facing food shortages. In the UK, we have campaigned for the British government to help maintain long-term peace and development in South Sudan. Many people in South Sudan are in urgent need of food, water, healthcare and safe places to stay.